César Braga-Pinto is a Professor of Brazilian, Lusophone African and Comparative Literature at Northwestern University. He is the author of A Violência das Letras: Amizade e inimizade na literatura brasileira (1888-1940) (EdUERJ, 2018) and As Promessas da História: Discursos Proféticos e Assimilação no Brasil Colonial (2003), and the editor of Ligeiros Traços: escritos de juventude de José Lins do Rego (2007) and À Procura de Saúde: crônicas de um doente/ In Search of Health: chronicles of a sick man (2015). He also co-edited with Fatima Mendonça a collection of early 20th-century Mozambican journalism writings entitled João Albasini e as luzes de Nwandzenguele: literatura e política em Moçambique 1908-1922 (2014). “The Pleasures of Imitation: Gabriel Tarde, Oscar Wilde and João do Rio in Brazil’s Long Fin de siècle.” Comparative Literature Studies. “Extravagants, Eccentrics and Deviants in the Brazil Belle Epoque; or, how João do Rio emulated Oscar Wilde.” Special Issue of Journal of Latin American Cultural Studies: “Absolutely Modern: The Uses of Oscar Wilde in Latin American Literature and Culture.” [40 manusc. pages] Forthcoming. “Sexualidades extra-vagantes: João do Rio, emulador de Oscar Wilde.” Revista da Abralic – Associação Brasileira de Literatura Comparada.” Forthcoming. "From Abolitionism to Black Face: the Vicissitudes of Uncle Tom in Brazil." (The Transnational Histories of Uncle Tom's Cabin. Tracy Davis and Stefka Mihaylova. University of Michigan Press, 2016). “Darwinism, Max Nordau and Raul Pompeia’s Struggle for Existence.” Foreword to The Athaeneum. Evanston: Northwestern University Press, 2015. pp. vii-xvii. "The Honor of the Abolitionist and the Shamefulness of Slavery: Raul Pompeia, Luiz Gama and Joaquim Nabuco. "Luso-Brazilian Review (2014). “Time and Alterity in Padre Antônio Vieira’s History of the Future”. (Portuguese Studies Review); and "A Paris de Nestor Vitor e o mundo de Pascale Casanova" (Remate de Males). 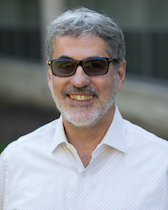 Professor Braga-Pinto has previously taught at Rutgers University and was a visiting professor at Columbia University and at the Eduardo Mondlane University (Mozambique) as a Fulbright Scholar. He was also a Visiting Senior Research Fellow at the Brazil Institute at King's College in London (2013) and a post-doctoral fellow at University of São Paulo (2006-2007). In 2005 he participated in the NEH (National Endowment for the Humanities) Summer Institute on African Cinema in Dakar, Senegal.